Download our iOS app to get faster access to scholarships from Arizona State University. Discover and Follow 4-year colleges that are the best fit for you based on cost, major, location, and more. Add your courses and grades, activities, work experience, and more to your Portfolio as you progress through high school or community college. Instantly earn scholarships from your favorite 4-year colleges as you add achievements to your portfolio. The scholarships you earn from each college will be honored as the minimum financial aid you'll receive from that college when you enroll. Abby Saxastar raised $80,000 on [RaiseMe], which will fully cover her tuition at Stetson University, a private college in central Florida. "I've always been very successful in school and I've also done a lot of volunteer work," said Saxastar. "But I still had to figure out how to pay for college." 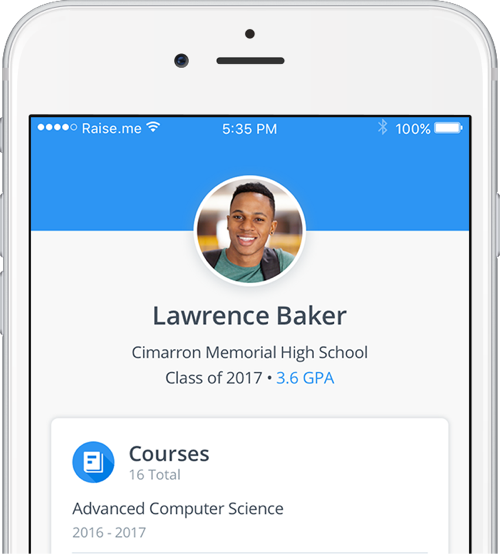 By highlighting and rewarding certain academic and extracurricular activities, [RaiseMe] helps level the college playing — and paying — field for low-income students who may not receive the same kind of parental advice at home as their higher-income peers. With its new "family assistance scholarships," [RaiseMe] is hoping to enable a growing movement among selective colleges to recognize contributions by low-income students — those who are often shut out of the traditional college admissions horserace because of family obligations and limited opportunities.